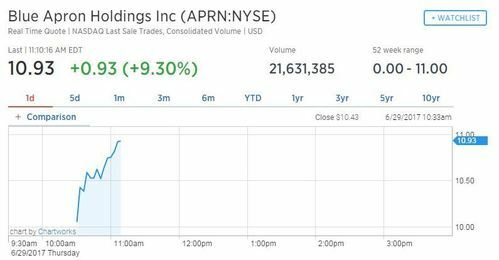 Blue Apron shares failed to open above their IPO price of $10 when it debuted on the stock market today, but investors are showing keen interest in the meal-kit maker. The company's IPO price of $10 values the company at $1.9 billion. Since opening, they are up more than 9 percent. On set Carl Tannenbaum, Chief Economist at Northern Trust is explaining that he used to stress bank balance sheets on behalf of the Federal Reserve. Steve asks him what he thinks of the latest round of results. Selfishly I would say the Fed has gone easy since I left but of course times are better for the banks and the American economy. Tannenbaum highlights that U.S. banks have built up a wall of protective cash to absorb any shocks. On consumer credit, Tannenbaum notes the Fed's early warnings for a couple of banks but says the American consumer has reduced debt considerably in relation to household income. He does note the car debt issue as a bit of an issue but student debt is not likely to be a problem. The Department of Homeland Security has unveiled new security measures to avoid the expansion of an in-cabin laptop ban. 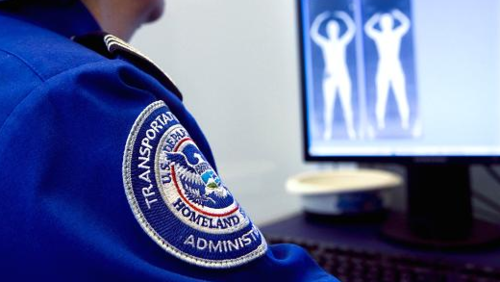 The measures will go into effect in three weeks, and could impact as many as 2 thousand commercial flights arriving daily into the United States. - More thorough carry-on bag checks. - More swabbing for explosives. - and in time, next generation bag screening technology. If any airline doesn't meet the new requirements, Homeland Security could ban its flights, or ban all personal electronics larger than a cell phone. Bank of England Governor Mark Carney says the central bank will debate a rate rise in the "coming months". 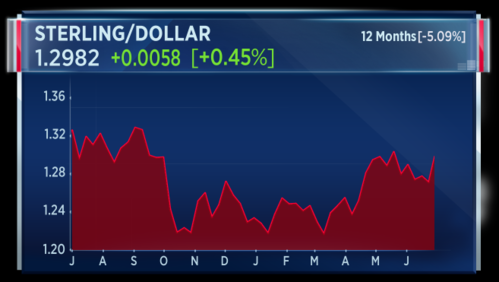 That sent Sterling to its highest level against the dollar since the UK's general election on June 8. Plans by Nestlé to strengthen its capital structure appeared to be well received by investors after shares closed almost 1 and half percent higher. The Swiss food and drinks giant announced a $21 billion share buyback and hinted at acquisitions in consumer healthcare. The shake-up comes days after activist shareholder Third Point urged Nestlé to shed non-core assets and buy back shares. Jon Cox, Head of European Consumer Equities, Kepler Cheuvreux says he thinks Nestlé and Third Point may actually be fairly well aligned in their ambitions. I think what Leon does is give Mark Schneider, the new boy on the block of Nestle's management team, the impetus to get on with accelerating earnings. Cox says fast moving consumer good firms such as Nestlé will soon start to benefit from an end to deflationary pricing and that a level cost cutting is still available. He says in emerging markets, the big companies recognize a need to move faster on what locals are demanding and he says that will happen. Chinese President Xi Jinping has arrived in Hong Kong to celebrate the 20th anniversary of the handover from British to Chinese rule. Protests over China's influence in the financial hub have accompanied his visit. 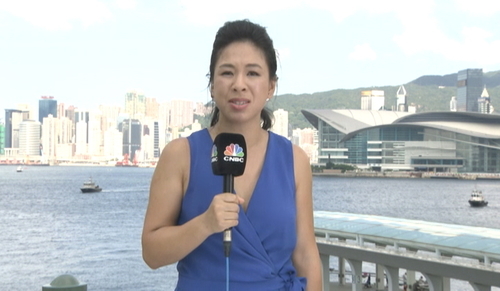 Emily Tan in Hong Kong says arrests of well known student protesters have already been made ahead of the July 1st protest which is likely to be the biggest event. Tan says democracy and ease of business are, on the surface, still in place in Hong Kong but the next stage for analysts will be to see what Hong Kong's new chief executive will outline for the next 5 years. The chief executive designate, Carrie Lam, is seen as being favored by Beijing. Bank of Japan board member Yutaka Harada said on Thursday a weak yen will stimulate the economy and help accelerate inflation. He also said the BOJ's current policy framework is based on the premise that the central bank will raise interest rates should inflation accelerate well above its 2 percent target. That's according to Reuters. We don't know when it will happen but at some point, the BOJ will undoubtedly need to tighten monetary policy, Harada said in a seminar. 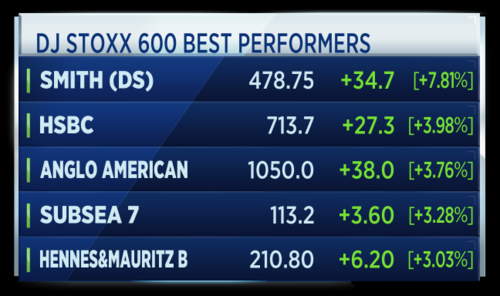 Another look at this morning's positive reaction in European bank stocks. This following buyback and dividend announcements in the U.S. after the Fed approved shareholder payout plans. The thing I would like to see is particularly in Europe if there is consistency in voice when they are engaging with Donald Trump because I suspect that there won't be. Because if you see Donald Trump's interaction with the rest of the world, there is a vacuum being created for someone else to step up and carry the flag of free trade. Rio Tinto shareholders have approved the sale of the miner's Australian coal assets to China-backed Yancoal. Shares have risen more than 3 percent this morning. Rio Tinto's chairman said it had not decided how funds from $2.7 billion dollar deal would be used. This amid calls by shareholders to boost dividends or buy back shares. The approval ends a bidding war with Glencore, which also wanted Rio's coal assets. The UK government is expected to announce its decision today on whether to give the green light to 21st Century Fox's takeover of Sky. Having weighed reports from regulators, Culture Secretary Karen Bradley will reveal whether to approve the £11.7 billion deal or refer it for a fuller investigation. I think we need to take into account the interest rate. If you are a CEO and you are looking for opportunities for M&A and you also have a sense as most of them do that interest rates do have to go higher, you make those accusations now when they are going to be cheaper. So it is a combination of dramatic changes both within the industry but also market environment that is good for M&A activities. Buybacks make a comeback! 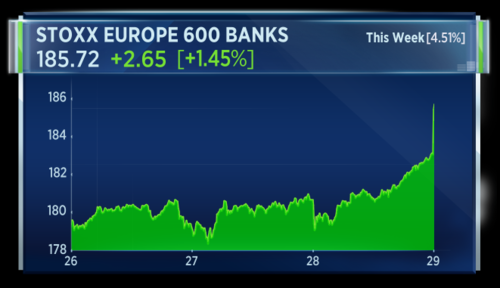 European financials rally after gains stateside for some of the largest lenders, which got the green light to launch 100 billion dollars of returns to shareholder. Fashion forward for H&M shares which jump to the top of the Stoxx 600 on forecast-beating results and a bullish outlook. 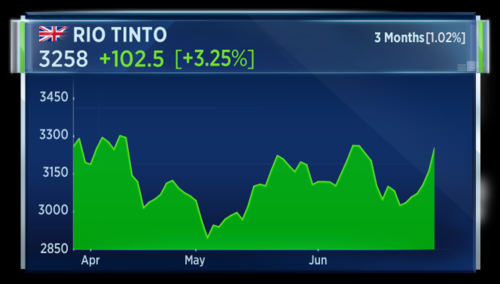 A rally for Rio Tinto lifts the mining sector, after it agrees to sell 2 point 6 billion dollars in coal assets to Yancoal. The unity of the European Union is stronger than some debates suggest. That's the message from Angela Merkel as the German chancellor tells the Bundestag the bloc is prepared for Brexit. Investors appear to be picking up on messages from central bankers that a tightening of policy is no longer to be restricted to the United States. 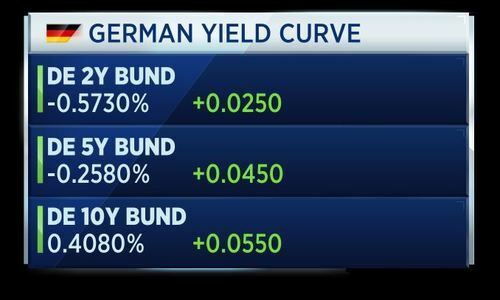 Comments from ECB President Mario Draghi at the central bank's forum in Portugal appear to have convinced some money movers that the bank will accelerate plans to taper its stimulus plan. 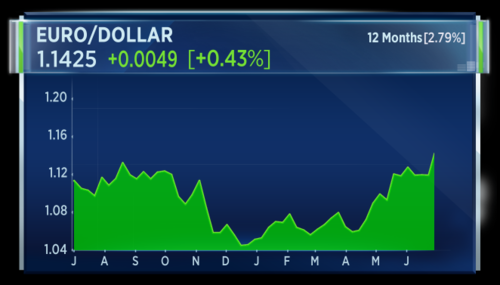 That, as well as a weakening of the U.S. dollar have pushed that pair to levels not seen since this time last year. Reuters is reporting some analysts who believe the ECB is being misinterpreted and that its main message was not one of stimulus removal but rather that it was prepared to look through short term weaker inflation. The Bank of England Mark Carney has also made comments in the last 24 hours that have been interpreted as a sign that the UK central bank will raise rates in the not too distant future. Carney said: "some removal of monetary stimulus is likely to become necessary if the trade-off facing the MPC continues to lessen and the policy decision accordingly becomes more conventional". CNBCAlibaba said the new investment will increase its stake in Lazada from 51 percent to 83 percent. 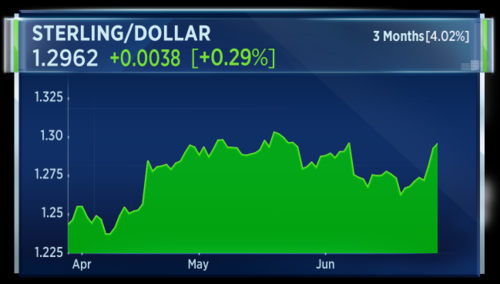 Money markets are pricing in a roughly 90 percent chance the ECB will lift interest rates by July 2018, reflecting a rise in investors' rate-hike expectations after comments from the ECB earlier this week were seen opening the door to policy tweaks. That's according to Reuters. Forward Eonia bank-to-bank rates dated for the ECB meeting in July 2018 stood on Thursday at around minus 0.2713 percent, about 9 basis points above the Eonia spot rate of minus 0.3620 percent. This gap suggests markets are pricing in a roughly 90 percent chance of a rate hike by the end of July 2018. Market expectations for a tightening in monetary policy have shot up this week after comments from European Central Bank chief Mario Draghi, remaining elevated even after the ECB tried to soothe the market reaction on Wednesday. 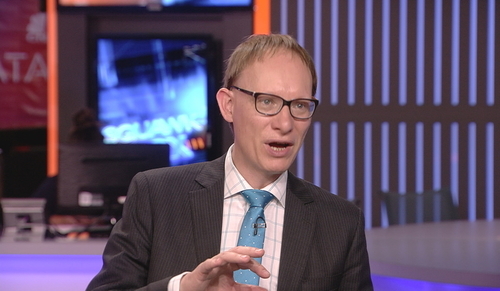 "I think markets are getting ahead of themselves again on ECB rate normalisation hopes," said Martin van Vliet, senior rates strategist at ING. The government is fully aware of the welter of new rules banks face at a time of low interest rates and other challenges, Britain's new financial services minister said on Thursday. That's according to Reuters. Two weeks into the job, Stephen Barclay, a former financial regulator who has worked in banking, struck a conciliatory tone, saying it was very clear that the pace of regulation has not abated. "In government we need to be mindful of the cumulative impact," Barclay told a British Bankers' Association conference. Banks face new rules to prevent money laundering, requiring them to ring-fence their retail arms with their own layer of capital, and opening up the payments services market with new EU rules to boost innovation, Barclay said. The British government says the U.K. regulator OFCOM finds 21st Century Fox's acquisition bid for Sky raises public interest concerns. The government adds that OFCOM believes the Murdoch Family Trust would have material influence over multiple platforms. Here's part of the statement from U.K. Culture Secretary Karen Bradley regarding the announcement concerning 21st Century Fox's takeover bid for Sky. On the question of whether the merger gives rise to public interest concerns in relation to media plurality, Ofcom’s report is unambiguous. It concludes, “The transaction raises public interest concerns as a result of the risk of increased influence by members of the Murdoch Family Trust over the UK news agenda and the political process, with its unique presence on radio, television, in print and online. We consider that the plurality concerns may justify the Secretary of State making a reference to the Competition and Markets Authority”. On the basis of Ofcom’s assessment, I confirm that I am minded-to refer to a Phase 2 investigation on the grounds of media plurality. Bradley added that the transaction "may increase members of the Murdoch Family Trust’s ability to influence the overall news agenda and their ability to influence the political process and it may also result in the perception of increased influence." James Brokenshire, Britain's Northern Ireland minister, says the Northern Irish political parties are continuing to engage intensively, but a number of issues remain outstanding, according to Reuters. The minister says restoration of power-sharing remains achievable. He says he wants to see a restoration of devolved government "as soon as possible." Today is a deadline for Northern Ireland's DUP and Sinn Fein to reach a deal on a power-sharing arrangement. The fallout from this week's cyberattack on Europe continues. Computers at Russia's state-owned Gazprom were also infected by the attack on Tuesday, according to Reuters citing a government official. OFCOM has confirmed the findings of its report that were announced by U.K. Culture Secretary Karen Bradley in parliament earlier today. The regulator says it identifies a risk of increased influence by members of the Murdoch Family Trust over the U.K. news agenda. 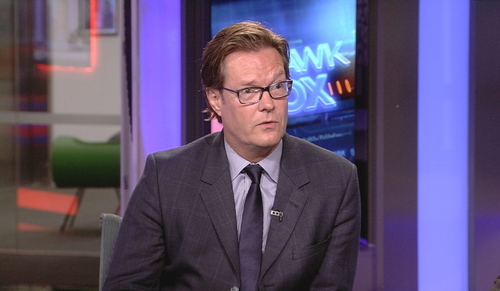 It also considered allegations of sexual and racial harassment at Fox News that are extremely serious and disturbing. It considers these concerns justify referring the merger bid to the Competitions and Markets Authority. Let's look at what economic data and earnings are coming out today from the U.S.
At 8:30 a.m. ET we have jobless claims for the week ending June 24. This is seen increasing by 241,000. At the same time we have the third estimate for Q1 U.S. GDP. The economy forecast to have grown at 1.2 percent. On the earnings front, we have Walgreens, ConAgra and Constellation Brands reporting before the bell. After the bell, Nike, American Outdoor Brands and Micron will post results. Northern Ireland parties have been given until today to reach new power-sharing deal. The Sinn Fein party says limited progress has been made in Northern Ireland power-sharing talks so far. They told Reuters that they will not countenance a return to direct rule. Exploration and production company ConocoPhillips says it has agree to sell Barnett assets for $305 million. ConocoPhillips says the sale will impact full year production by less than 5,000 barrels of oil equivalent per day, depending on timing of the closure. 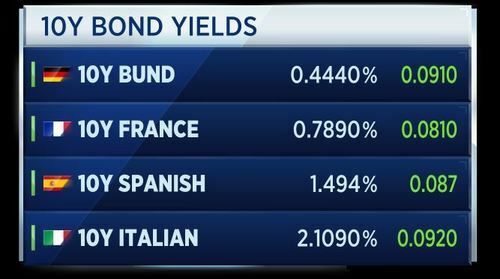 Euro zone bond yields are higher today and continue to extend rises. The yields are up between 6 and 9 basis points, according to Reuters. This is the result of hawkish comments from the ECB and Bank Of England earlier in the week, which have pushed up currencies and bond yields. U.S Treasury yields are also rising, hiting multi-year highs. 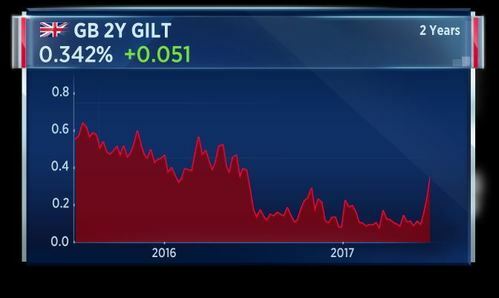 In Europe, the German five-year government bond yield is at its highest level since March 2016. Northern Ireland's DUP says there will not be a breakthrough in talks to restore power-sharing before the 3pm deadline. However, the party says it can reach a deal within days. The DUP and Sinn Fein had until today to negotiate a power-sharing arrangement. Speaking in Berlin, President of the European Council Donald Tusk says he is determined to strengthen rules-based international order. He says EU countries will speak with one voice at the G20 summit. Also, on the topic of the refugee crisis, Tusk says he wants the United Nations to take action against people smuggles, adding that the summit will be a food forum to discus this. The Nasdaq has issued a warning that several of its markets are experiencing systems issues. It says it will send an update once it has additional information. The affected markets include the options market, the GEMX option, the OMX BX and the PHLX. The exchange says all orders on the PHLX will be cancelled off the book and the system restarted to address the issue. Ruper Murdoch's 21st Century Fox says it is disappointed the U.K. does not accept the undertaking of its takeover bid for Sky. The U.K. government earlier said the regulator OFCOM had public interest concerns about the deal. Fox says it will now make representations to the culture secretary Karen Bradley regarding her provisional decision over the deal, according to Reuters. Fox says that if the deal is referred to the competitions regulator, the deal could close by June 30, 2018. Tag Oil says average net daily production increased by 3 percent to 1,218 BOE/D for the quarter ending March 2017. Tag Oil says its capital budget for 2018 is $27.4 million. It estimates 2018 full year revenue will be $28 million. The company adds that if pil remains below $55 per barrel for any length of time, the company will reduce its capital program. 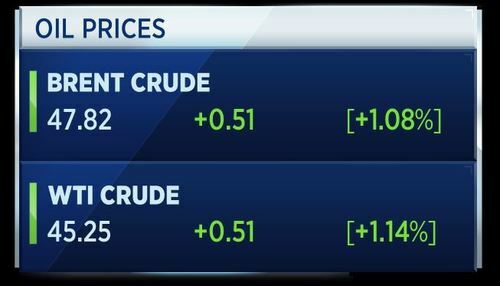 Oil prices are recovering a little today, up more than 1 percent. The Nasdaq exchange says all orders on the Nasdaq option markets are to be cancelled off the book and the system restarted. The same was done earlier to the PHLX market. Nasdaq says the PHLX system restart is expected to be completed at 09:15 a.m. ET. U.S. markets open mixed. The Dow and S&P are flat, while the Nasdaq is falling. 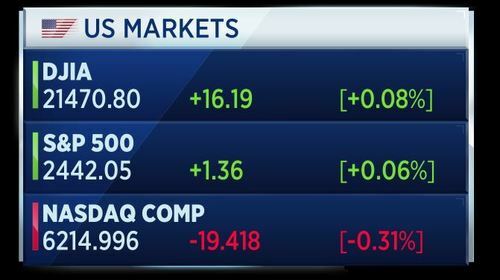 The Nasdaq enjoyed its best day of the year yesterday, so we may be seeing some early profit taking. In focus is the IPO of Blue Apron. Before the bell, U.S. GDP growth for the first quarter came in at a better than expected 1.4 percent. That was an upwards revision from the previous reading of 1.2 percent. 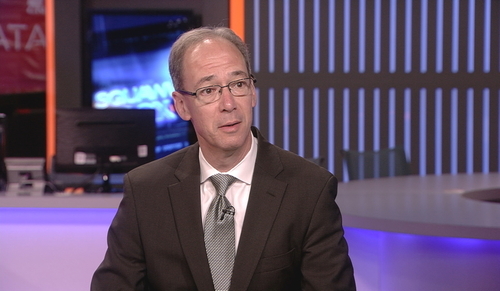 Despite the upwards revision, Jim O'Sullivan, chief U.S. economist at High Frequency Economics, says Q1 growth looks weak. Q1 growth still looks weak, even relative to the paltry expansion-to-date average of 2.1 percent at an annual rate. However, growth has tended to be below trend in Q1s in recent years. The 1.4 percent pace is stronger than the average for Q1s. Over the last seven years, real growth has averaged just 1.0 percent at an annual rate in Q1s, well below the 2.5 percent average for Q2, 2.5 percent for Q3 and 2.4 percent for Q4. Meanwhile, key momentum indicators such claims and the ISM indexes are not corroborating a slowing in the trend, while direct input data for Q2 to date are showing a pick-up. We continue to forecast a 3.0 percent pace in Q2. O'Sullivan also commented on the weekly jobless claims number, which increased to 244,000. Claims remain low, consistent with the trend in employment growth remaining more than strong enough to keep the unemployment rate trending down. The 242,000 averaged over the last four weeks is down slightly from 246,000, on average, in Q1 and 263,000 in all of last year. The data reinforce our view that the slowing in payrolls in May mainly reflected statistical noise. We have not yet settled on a precise number, but we will be forecasting a rebound in payrolls growth in next week's report for June. We are still awaiting the first opening trade of Blue Apron. 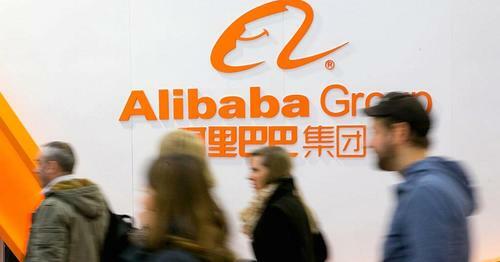 Around 30 million shares were sold at IPO for $10 each. Reuters indicates they are set to trade between $10 and $11, down from the earlier range of $10 to $12. Territory controlled by the Islamic State is down 60 percent and its revenue is down 80 percent, according to research by IHS Markit. Since January 2015, when a "Caliphate" was declared by an Islamic State leader, territory controlled by the group has decreased from 90,800 km squared to 36,200 km squared. Meanwhile, the money generated by Islamic State in oil, gas, taxes and confiscations, as well as other sources, has decreased from $81 million per month in Q2 2015, to $16 million in Q2 this year. However, despite its shrinking power and resources, IHS Markit predicts attacks abroad will likely increase before they decrease. Here's what Firas Modad, senior Middle East analyst at IHS Markit, had to say. Egyptian, Saudi Arabian and UAE efforts at weakening radicals’ influence, and pressuring clerics to develop a new interpretation of Islam that is reconciled with modernity, are likely to drive some Islamist conservatives into embracing violence. Efforts by Western governments to confront Islamists are likely to have the same effect. Terrorism risks from Islamist groups are therefore likely to increase before they decrease. 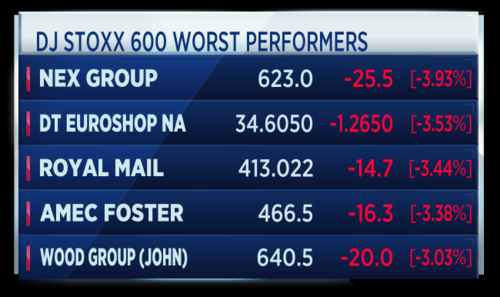 Losses were spread among all the major European markets. Some fell less than others; the FTSE 100 finished down around 0.5 percent, while the German DAX dropped nearly 2 percent.